Three months to go and the RTN preparation has entered the final quarter! The new RTN jersey is out! A very big thank you to all sponsors, but in particular to GOT who have sponsored the jersey once again. After collection events in Aberdeen, Stonehaven & Elgin, around half of the jerseys are now with their owners – the remaining will be sent out on Friday 5 June. I appreciate that some people may have misjudged the size of the jersey ordered. If you find that the jersey doesn’t fit, you may wish to use the forum set up on the Ride the North Facebook page https://www.facebook.com/inverness.to.aberdeen/posts/859372370809381 to attempt to find a swap (possible that more people want to trade up than down, but lets see). If this doesn’t provide a solution, email me on Friday 26 June and I will do what I can to swap …this depends upon what spares I have after withdrawals (see next item)! If you are unable to take part in Ride the North, it would be helpful (for everyone) to know that now. If you withdraw from the event prior to me sending the jersey, I am happy to refund you 90% of the fee you paid. As noted last month, withdrawals until the end of June 2015 are subject to a 75% refund. Unfortunately we cannot make refunds for withdrawals after 30 June. While the above says ‘unable’ at this point in the year you might/should know how your training is going …and if you have fundamental doubts, now is the time to declare. Again, this item relates to the next! We ran a couple of information events over the last couple of months and the two key messages I wanted to impart were: (i) The route this year might just be a little more difficult this year – there is a little more climbing and while this was all set out when the details went live last year …probably nobody paid any notice when the booking opened! (ii) That this should not put off anyone who is doing RTN as a challenge – There will be 11 hours available each day to cover 84/88 miles and my expectation is that some people will want to leave at the earliest chance, take their time, stop for breaks and may well “choose” to walk up the steepest hills. That is all fine …and what the event is all about. If, on the other hand, you find that you are walking on hills which aren’t the steepest or are really worried about the event, I would be delighted to speak to you to answer any questions. This year’s RTN finish line will be in Stonehaven. 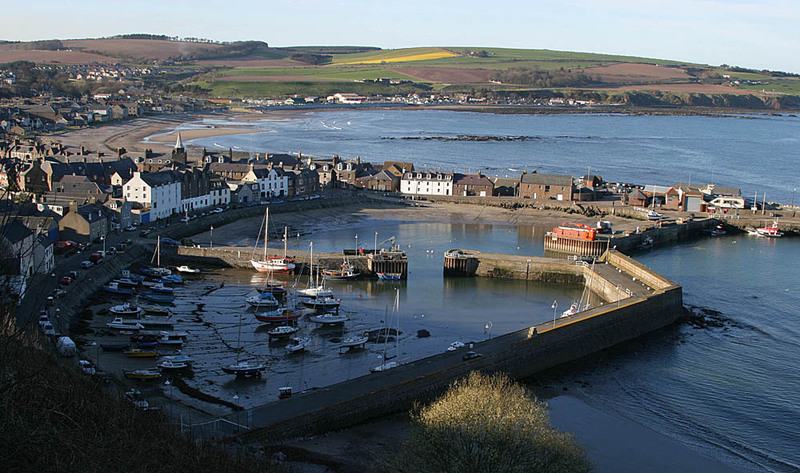 This is not a new development for Ride the North as the very first event finished in Stonehaven in 2011 – and since then no other community has supported the event more with around 110 riders from Stonehaven this year. We are working with the local community Aberdeenshire Council & Police Scotland to firm up arrangements and hope I will be able to clarify plans next month. The full route will be signposted, but digital files of the route for upload to GPS devices will be issued much closer to the event (possibly around 10 days before RTN). Each year there seems to be one road works issue or some discussion about location of a refreshment stop which has meant subtle changes. If I leave it until close to the event I hope to ensure that the route issued is the final one and there is no confusion. 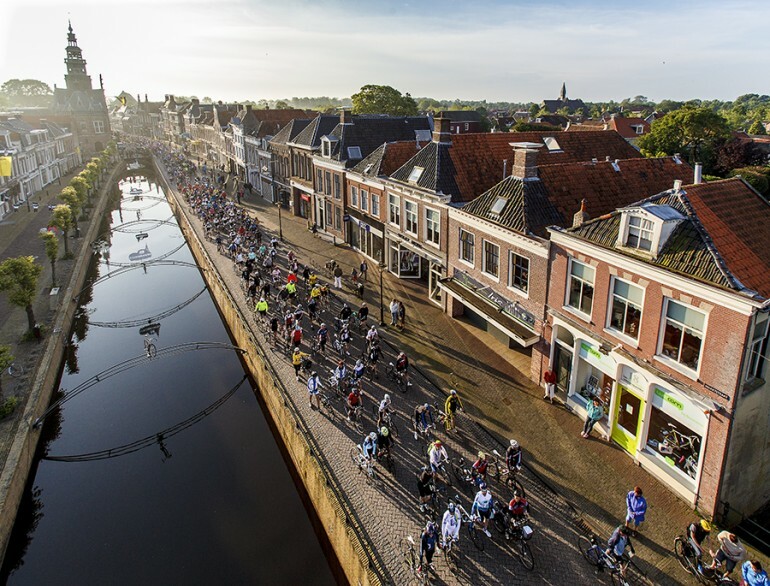 Ride the North went ‘Dutch’ this month, with event managers Neil & Robin taking part in Fietselfstedentocht. The 11 Cities Cycling Tour is an institution in The Netherlands and celebrated 100 years in 2012. Every year 15,000 people ride 146 miles around 11 cities (mostly what we would call towns) of Friesland and with it being a ‘just for fun’ challenge with no timing and with riders stopping for refreshments along the way, I had always wanted to see it in action – so this year success in the ballot, a limited edition RTN orange jersey and we were off! In every village local residents sit in the garden/street to cheer the riders (high fives from the children) and in each of the eleven cities you must stop to have your card stamped …and the main squares are a buzz with bands playing and a carnival atmosphere. In the countryside there were even cafes operating out of tractor sheds! The event has the broadest mix of fancy dress riders on ‘Dutch’ bikes (the finish-line is open until midnight) to peletons of cycling club mates flying along at speed. However, this is an event with a MAXIMUM average speed, so absolutely everyone stops for coffee, cake, lunch along the way. A really incredible experience, loads of educational value for the cycling event organiser …and just great fun! On 21 June the Great Inverurie Bike Ride takes place in Aberdeenshire while in Elgin its the Glen Moray Sportive & Bike Ride. These are two of our region’s established running cycling events and always popular for those training for RTN …bit of a shame that the two Councils which organise them don’t agree a plan to avoid a date clash, but that’s another matter!! Two great events and hopefully the longest day will be a sunny one (and not too long)! There are plenty of other events out there, so do explore and I would be delighted to use the RTN social media to promote. If you are on Twitter please do follow us @ride_the_north and feel free to share your training. We don’t use Twitter to disseminate too much important stuff, but it can be a fun way to link up with others. As always feel free to get in touch if you have any questions.